The U.S. Mint’s weekly sales report was released yesterday with updated numbers for product sales through Sunday, August 9. The 2015 American Liberty High Relief Gold Coin, which debuted with a formidable 41,930 sales last week, was fairly quiet between August 3 and August 9, adding a modest 837 sales. It’s possible the initial rush has been slowed by reports of some American Liberty HR coins reaching buyers in less than perfect condition. It will be interesting to see if this coin picks up steam again next week, and whether the Mint can allay some of those quality concerns for would-be purchasers of the coin. The biggest draws this week were the 2014 and 2015 American Eagle Silver Proof coins, which sold 13,742 and 13,840 units, respectively. The 2015 1 oz. 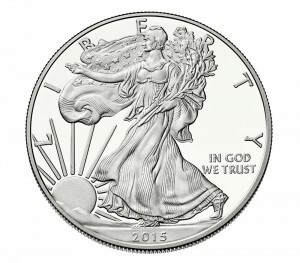 Silver Eagle is now on back order at the U.S. Mint’s Web site. Other items that sold well this week were the 2015 U.S. Mint Proof Set, with 5,985 units sold; the 2015 U.S. Mint Silver Proof Set, with 3,527 sold; and the 2015 U.S. Mint Uncirculated Set, which sold 2,827 units this week. Yesterday’s big story was the near sell-out of the 2015 Eisenhower Coin & Chronicles Set within 15 minutes of its release; that item won’t be listed on the U.S. Mint’s weekly sales report until next Tuesday. The following statistics show total sales for the listed items through August 9, 2015. The first numerical column includes information from the mint’s August 2 report, the second column displays this week’s updated numbers, and the third column tallies the increase in sales over the last week. For more information on any of these items, visit the U.S. Mint’s online product catalog. I want to THANK YOU for the U.S. Mint Sales Report I am very happy . I have a Red Book collection that goes back to the 50’s missing some but not many, it’s so nice to see current sales . With the Red Book it is amazing to look at the prices back years ago and to compare that to present price increase in this hobby . You’re welcome! I agree that’s it’s very interesting to look at the older prices.